New Year is the special time of the year, when everyone believes in magic and miracles. Therefore, each country has its own traditions and unusual New Year’s elements. 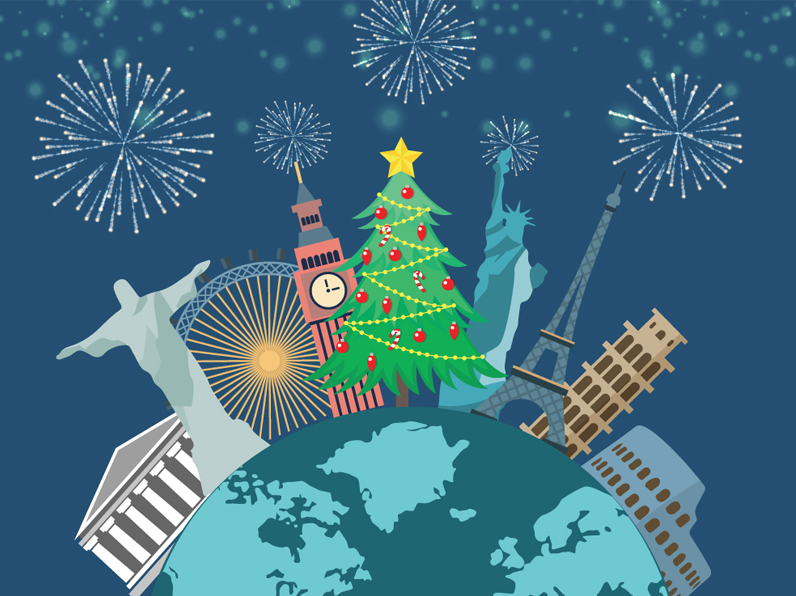 Having explored some of the main customs of Great Britain, Italy, France, Spain, Brazil and Portugal, we’ve decided to share the peculiarities of their New Year celebrations. Traditional food and things that bring good luck are included. Typical celebrations of New Year in English-speaking countries include wishing each other “Happy New Year” and raising a glass at midnight. Not well-known tradition that is mostly common in Scotland says that the first visitor that comes to the house after New Year brings luck. Consequently, young men, wearing a traditional kilt, visit their relatives and friends after midnight. A very interesting tradition of Spanish people is to eat grapes and make wishes. You don’t simply need to swallow them or eat the amount you can. There is a condition for dreams to come true. For each chime of the clock you need to chew a grape and make a wish. If you swallow or lose count, your wishes won’t come true. My advice is to practice beforehand! The most common tradition is exchanging champagne glasses clink and kisses in order to deliver good wishes. It is also worth mentioning that the French have very generous meals on New Year’s Eve that include foie gras, snails, oysters, smoked salmon, caviar, etc. Even though private fireworks aren’t allowed, it doesn’t make the feast less significant. The peculiarity of Italian men is to give red underwear as a gift on New Year’s Eve. Girlfriends, wives and even mothers receive it since they all believe that red underwear brings good luck and happiness. Do you recall the Italian tradition about red underwear? There is something similar in Brazil. If you are looking for love, don’t forget to put on a pair of red undies. However, if you already have a partner, you’d better wear a pair of white ones. Another peculiarity of Brazilian New Year’s Eve is parties on Copacabana and Ipanema beaches. Bet you’ve learned a lot new about New Year’s celebrations. Wish you all the best and may all your dreams come true regardless of whether or not you eat grapes.